When you think wicker outdoor furniture, you might recall the porch rockers and southern comforts of a bygone era. While natural wicker is susceptible to damage from weather conditions like rain and moisture, it’s durable cousin resin wicker offers the same look and feel with the ability to handle the outdoor elements. This means you can get the same country feel with a modern touch. Traditional wicker is made from all-natural materials, such as rattan or bamboo, while resin wicker is molded from polyethylene resin strung into fibers and wrapped around a strong steel or aluminum frame. Because resin wicker is made from artificial materials (essentially a type of plastic), it doesn’t biodegrade as easily as and stands up to the elements better than traditional wicker. Resin wicker’s color also doesn’t flake or peel off because, unlike the paint applied to traditional wicker, the color is created by mixing dye straight into the resin. You can still paint resin wicker another color if you first apply a plastic primer. Other than these material differences, resin wicker looks and behaves almost exactly like traditional wicker. It is a highly desirable material for patio furniture and makes up most of the wicker furniture you see for sale today. Even with its superior durability, it still costs less to buy than traditional wicker. Other names for resin wicker include synthetic wicker and all-weather wicker. The reason it’s called “all-weather” is because it’s highly water-resistant and can withstand damp climates and rainy weather. Even though it can maintain it’s quality in the face of in-clement conditions, it’s always a good idea to bring resin wicker inside during harsh weather and store it in the off season to prolong its lifespan. Although all resin wicker is made from a synthetic resin, there are a few different types of resin, some better than others. These materials include polyethylene, nylon, PVC, and high-density polyethylene (HDPE). The most durable material is HDPE. Other desirable traits of HDPE wicker include its resistance to fading in sunlight, stain resistance, and a natural-looking matte finish. Resin wicker doesn’t need much care, but you will still need to clean it occasionally. Washing with soap and water makes cleaning resin wicker pretty straightforward. And adding a touch of white vinegar to your soapy concoction can help prevent mildew growth in moist climates. Just make sure to avoid abrasive cleaners that can cause more harm than good. Bring a resin wicker furniture set inside for a creative way to decorate an interior living space. 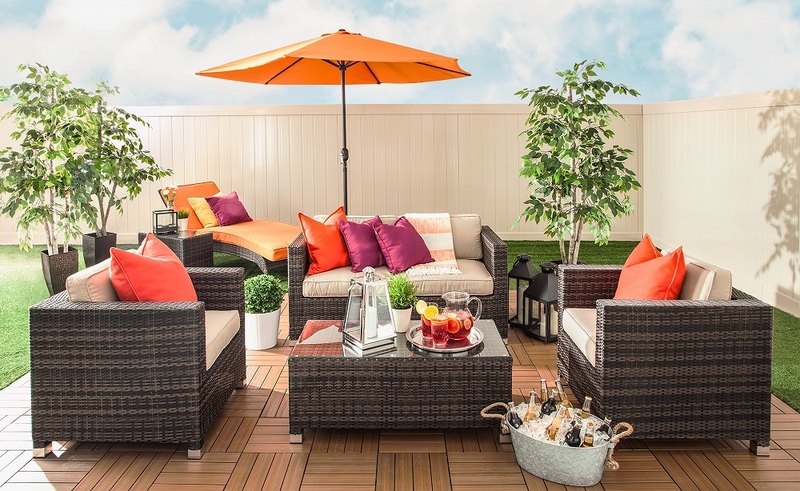 The same rules for embracing spring on your patio also apply to your interior home decor. Thanks to resin wicker’s neutral color selection and modern shapes, you can integrate resin wicker furniture into your home. It no longer needs to be solely a seasonal set. 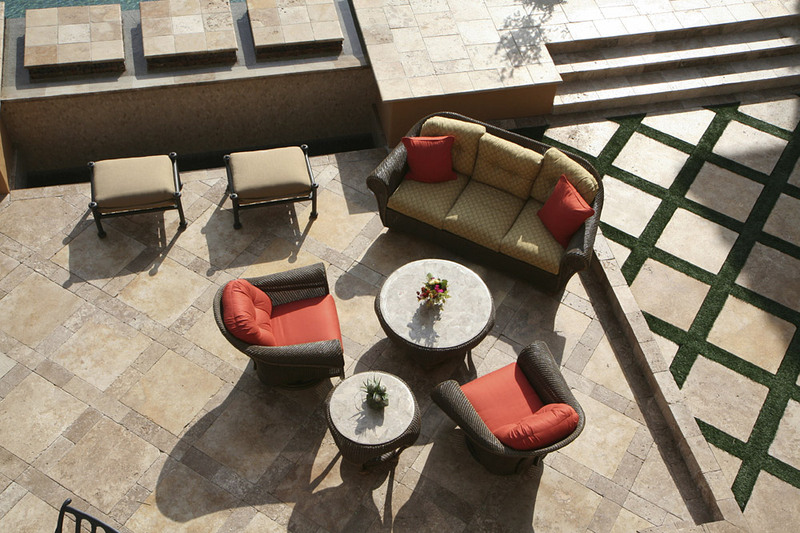 There are a variety of materials to choose from when buying patio furniture. When you choose resin wicker, your small investment will last longer than traditional wicker while still giving you that laid-back, natural country look. Do you like the look of wicker for your outdoor space? Browse our selection of charming Outdoor Furniture here. Find the right set for your space. Why Choose Cast Aluminum Patio Furniture?